Phew! Quite a substantial name for a pen, right? We're probably all familiar with Staedtler for their high quality stationery, and drawing supplies. Though only very recently they got into the magical world of high-end pens, with their conveniently named product line: 'Premium'. They definitely weren't planning on taking it easy. Instead of releasing a single pen, they went all out an came up with a complete collection! There's two main categories in their Premium collection: the Initium, and the J.S. Staedtler. 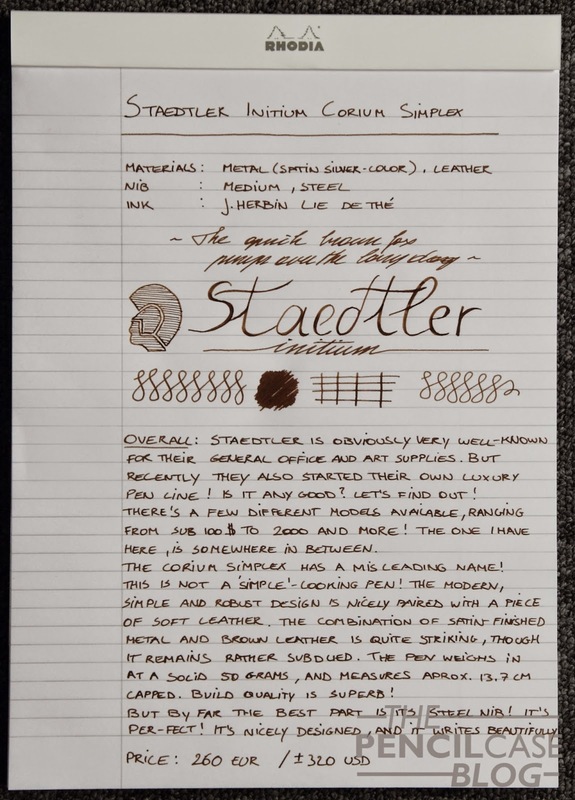 The J.S Staedtler is a cut above my -and probably a lot of people's- wallet, being the flagship series with solid gold nibs, special production processes and what not. 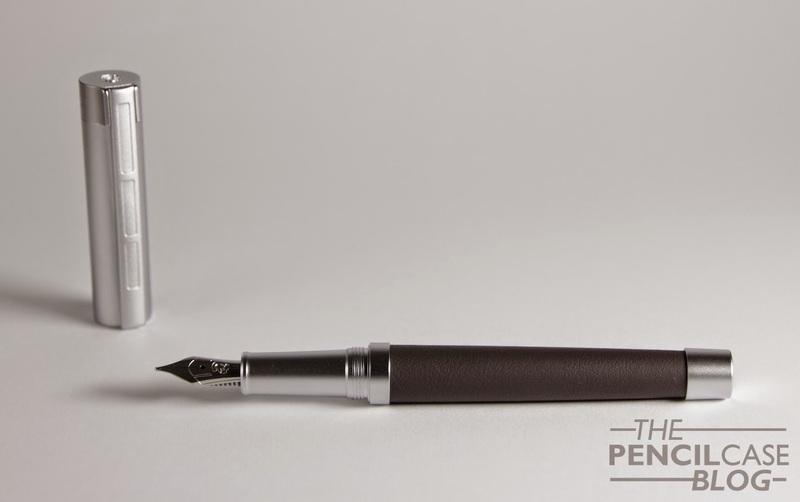 I'll be talking about a slightly more affordable fountain pen from the Initium collection: the Corium simplex. 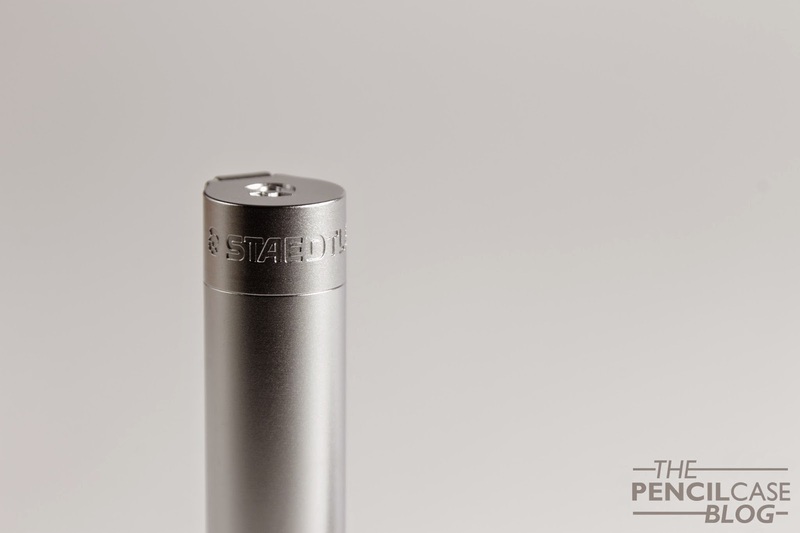 The Initium pens are the 'standard' models, though there isn't a single indication for being 'standard'. Right out of the box, this pen feels extremely solid and well made. 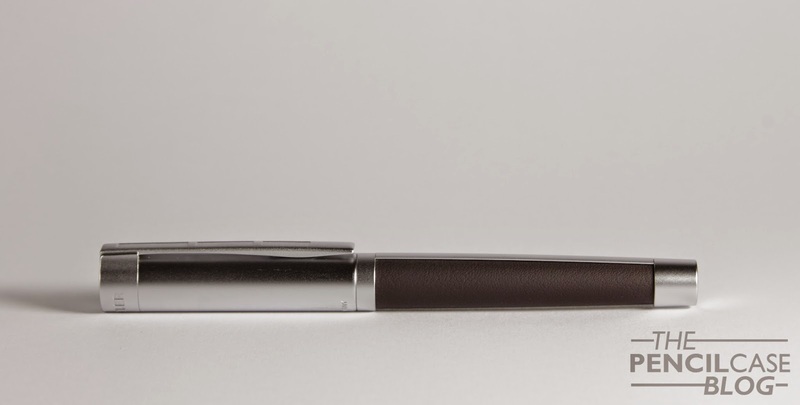 It's a completely metal pen with a satin silver color scheme, finished off with a piece of real leather (I chose the Brown leather, but it's also available in beige and grey). You immediately notice the heft when you pick up this pen. At 50 grams, this is definitely a serious piece of pen. All parts are nicely put together, which also adds to the overall solid feeling. If there's one flaw in the construction of this pen, it would be the clip, which does feel like it can be bent, and there's a slightest bit of lateral play to it. It also doesn't really look the part, but I'll come back to that in a minute. Despite the serious heft, it isn't really an overly large pen. At 13.7 cm capped, it's not small, but not really big either. Uncapped, you'll find quite a noticeable step from barrel to section. But that's made up for by the rather long grip section. The step is noticeable when holding the pen, but the good grip section does partially make up for that. The Corium is a good size for my hands, it's long enough to be used unposted. If you do decide to post it, you'll soon regret it. The cap only goes down as far as the 'blind cap' (the little metal section at the back, it's not an actual blind cap) goes, add to that the fact that the cap is quite heavy on itself, and you have a really long, back-heavy pen. It took me some time to really get 'into' the design. The modern, somewhat minimalist appearance, and the Metal-leather combo I'm sure is not for everyone. 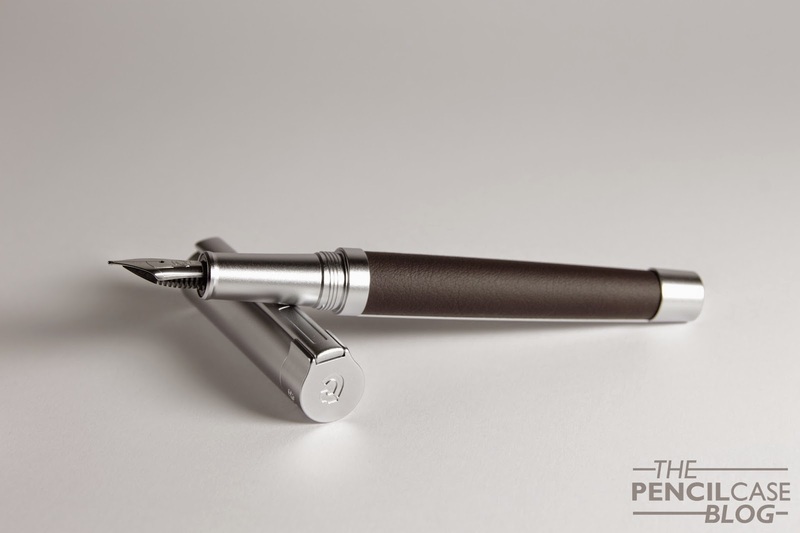 The pen did grow on me though, and I really enjoy the leather barrel, as it's very comfortable and warm in the hand. 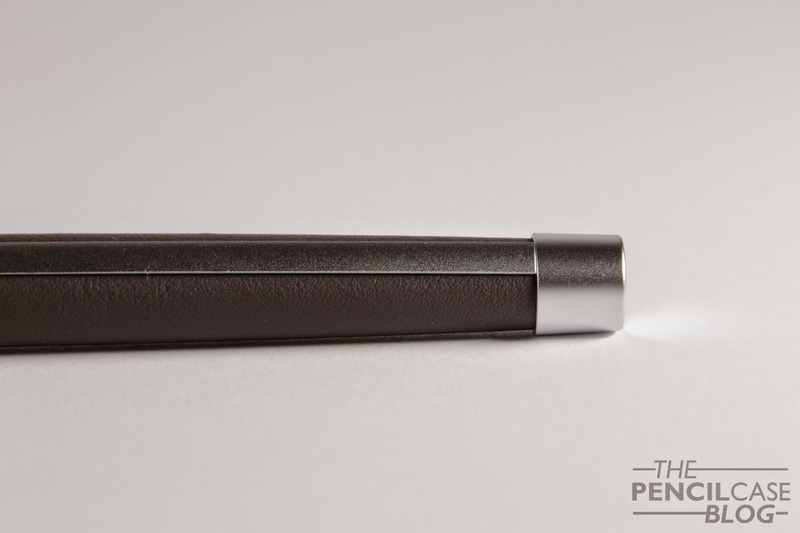 The leather does sit somewhat recessed into the body of the pen, so you'll feel the corners of the metal surrounding it while holding the pen. As I mentioned in the beginning of the review, the only thing I really didn't like about the design, is the clip. The build quality of the clip isn't completely on par with the rest of the pen, and for some reason it just doesn't fit in with the otherwise sleek design of the pen. I guess those little recessed rectangles in the clip just don't do it for me. There's one cool thing about it though: as you can see in the picture below, there's a metal bar that runs along the barrel, which helps keeping the leather in place. The clip actually lines up with this metal bar when you close the pen, which -I must admit- does look quite sleek! What I was most curious about, of course, was how this thing performed. Given the price of the pen, I expected quite a lot, and it definitely didn't dissapoint! 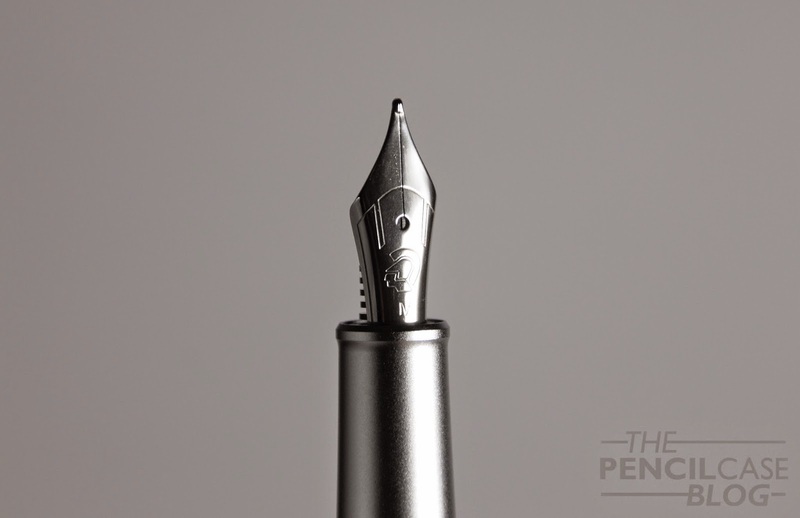 The steel nib has a simple, sleek appearance, and the Medium nib performed flawless out of the box. The Medium isn't exactly true to width, and seems to be more towards the broader side. It's a very smooth writer, though it has some feedback to it. I was really surprised by the performance of the feed, but in a good way. The flow is absolutely spot on for me, and it keeps up perfectly. It's quite a wet writer, but it doesn't overdo it. If there's one downside, it would be that it doesn't really have any 'give' to it, so you shouldn't expect much line variation. This steel nib definitely feels like it could easily compete with some of the gold nibs out there. But that's really the least I'd expect for the price this thing comes at. A gold nib that performs as good as this steel one would make it even better, but that'd probably up the price even more. Being relatively new to the high-end pen scene, Staedtler definitely did a great job on the Corium Simplex, but I do think there's some room for improvement when it comes to price, because expecially this Corium version doesn't come cheap: At 260 EUR / 320 USD, this definitely isn't your average impulse buy, but it does perform as it should, and it looks the part as well. It's worth mentioning that the resina and Lignum (the resin and wood versions of this pen) are substantially cheaper, at about 95 and 150 EUR respectively! 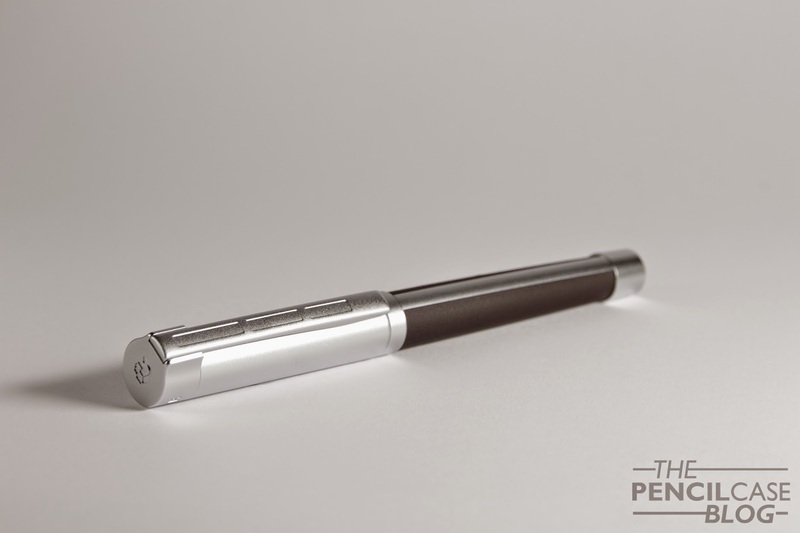 Note: this pen was sent to me by Penworld Antwerp, free of charge, so I could write this review. I was in no way influenced in the making of this review, nor was I monetarily compensated. The opinions shared in this review are completely my own! It seems Staedlert lacks some imagination. 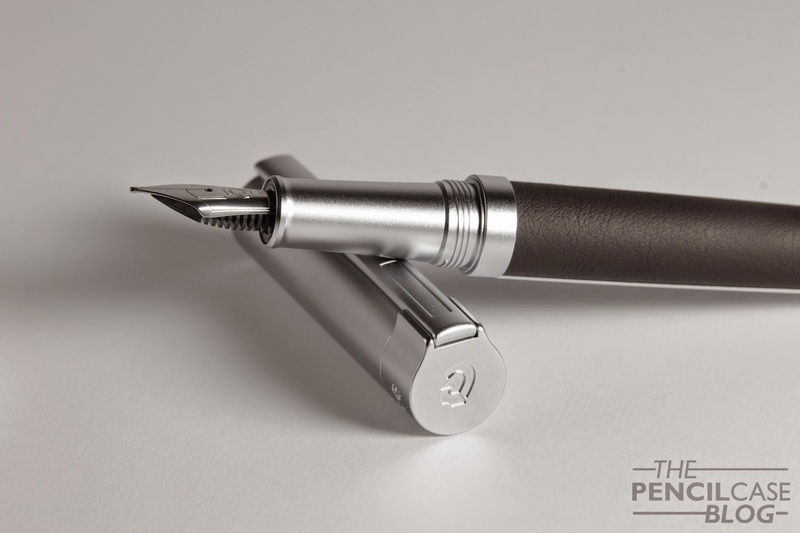 The name is too similar to Graf von Faber Castell Initio, itsn't it? Great. I love the Staedler Stuff! I have the Initium & lignum and these pens are awesome. Se the reviews on my site.